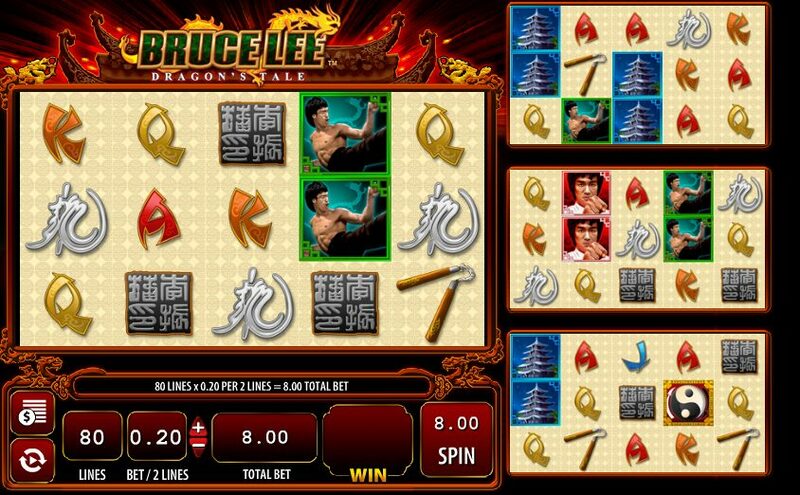 The original Bruce Lee slot has become one of slot developer WMS Gaming’s main titles due to its popularity with slots players online so it is no surprise that the slot inspired a sequel in the form of Bruce Lee - Dragon’s Tale. Immediately, when you begin playing this slot you see the difference with an incredible 80 pay-lines to play instead of the 60 pay-lines that you could play with on the original. It is also possible to play from 80p per spin up to a maximum bet of £80 per spin. This allows players on all sorts of budgets to be able to enjoy themselves without breaking the bank but the big bets can still be placed. As with the original, the reels are not set out as in most other slots. There is a main set of reels with three rows and 5 reels. There are then 3 smaller sets of 5x3 reels. Smaller in visual size, not in the number of reels or rows they possess. If you hit the Wild or the Scatter symbols on the main set of reels then they will transfer over to the three smaller sets of reels. This will give you more chances to win big prizes with these symbols. This action of the Wild and Scatters transferring from the main reels to the smaller reels is called the Super Multi-Pay feature. The symbols remain based on the iconic martial arts movie legend with Bruce Lee representing the Wild symbol. The Ying and Yang symbol acts as the Scatter symbol and is the key to triggering the free spins bonus round. Other symbols on the reels include Chinese writing and various kung fu weapons. Now, onto the free spins bonus round. This is where the magic happens. You must hit three or more Ying and Yang symbols across the main set of reels to trigger the free spins bonus round. You will be awarded with 10 free spins straight away and up to a 3x multiplier on all wins during the free spins depending on how many Scatters you triggered the free spins bonus round with. There's Also a 12x Multiplier and 10 Extra Free Spins to Win! This is not the end of it though. There is the potential for you to hit Scatters all over the main set of reels and the smaller reels. If this happens then you will have additional free spins and multipliers. If you trigger the free spins bonus round on just the one set of reels then you can win 10 free spins with up to a 3x multiplier. If you manage to hit enough Scatters to trigger the bonus on two different sets of reels then you will be awarded up to 10 free spins and a 6x multiplier. If you trigger the bonus on three different sets of reels then you will earn up to 10 free spins and a 9x multiplier. If you are fortunate enough to hit the Scatters to trigger the bonus on all four reels then you will win 10 free spins and up to a 12x multiplier. It is also possible to re-trigger the 10 free spins if you hit three or more Scatters across the reels during the free spins. It is in this free spins bonus round that Bruce Lee – Dragon’s Tale really puts its predecessor to shame with the more reels and larger prizes. Sadly, the potential wins are huge on this slot but they do happen very rarely. This game frustrates as often as it does excite. I played this slot for hours and won barely anything but I’ve heard stories about some players really hitting some big prizes. Overall, it’s not a bad little slot and is definitely an improvement on the original. 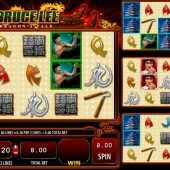 The original was beginning to feel a little dated and this sequel has dragged Bruce Lee into the new era of slots gaming. Does this game have much longevity to it? It depends. If you’re a patient player then you could fall in love with it. If you’re after the quick buzz and the easy wins then you would be better off looking somewhere else like on the Oriental-themed Dragon Lines slot from Ainsworth or the 50 Dragons slot from Aristocrat.